The home on Clinton Road in Brookline where two elderly sisters, Lynda and Sheryl Waldman, lived. The house, in one of the town’s most prosperous neighborhoods, is now condemned. BROOKLINE — Sheryl Hope Waldman grew up in a big and bustling house here in the 1950s, an attractive, cheerful girl with many friends. After attending Brookline High School and the University of Wisconsin, she returned to her childhood home to live with her older sister Lynda. Then, over the years, Sheryl Waldman faded from view until she vanished. And no one seemed to notice. For four decades, she shared a highly reclusive life with Lynda, six years her elder, inside their 4,000-square-foot home, a place where a warm, extended Jewish family once thrived, then bitterly fell apart. Over the years, some people witnessed flickers of Sheryl’s outgoing personality, but that soon subsided into the past — and so, too, her name. For reasons that are unclear, she began calling herself Hope Wheaton. The sisters’ once-grand house slowly fell into disrepair; the shuttered windows, collapsed porches, and broken gutters gave it an abandoned look. By last year, out of general concern, people began to call local police, health inspectors, and the state’s elder protective services agency. Each time, Lynda, standing in the doorway, insisted: We’re fine, please go away. And these authorities did, never once crossing the threshold into the house, exhibiting a respectful deference that made them miss something beyond their darkest imagining: that Sheryl Waldman was long ago dead. On a cold evening last December, a cousin who may have been the first outsider in decades to enter the house found the younger sister’s badly withered corpse under a kitchen table. The sisters, who craved privacy above all else, are now the subject of public soul-searching in a town that prides itself on progressive government and neighborly compassion: Could it be that easy for someone in their midst to disappear and die without anyone knowing? Is this an isolated tragedy, or a reminder about the vulnerability of those who lead hidden lives? And another question in this haunting case cannot yet be ruled out: Could this death have been a crime? Or the result of frightful neglect? The cause of Sheryl Waldman’s death is still pending autopsy results, and forensic testing is complicated by the condition of the body; officials estimate she may have died more than a year ago, before reaching her 68th birthday. 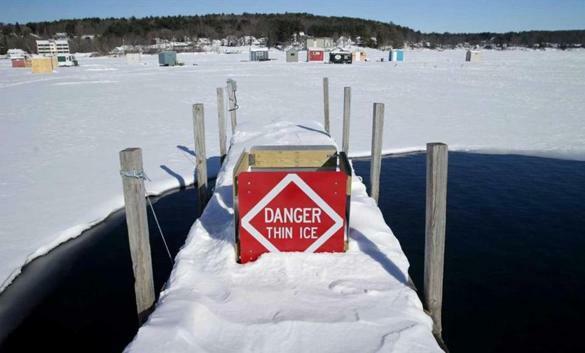 Police say there are no obvious signs of foul play. Local authorities have not pressed any charges against Lynda Waldman, 74, or restricted her freedom in any way, though the house, also heavily cluttered inside with papers, boxes, and old clothing, has been condemned. They have also declined to say whether they have asked for a psychiatric evaluation of the older sister. She has reportedly told authorities, in vague terms, that her sister died of natural causes and that she was at a loss about what to do with her body. 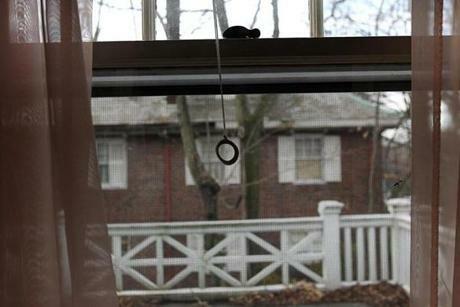 Meanwhile, Brookline police and the state agency that oversees elder protective services — both of which made several visits to the Clinton Road house in the past year — are in the process of self-examination, asking why they did not sooner discover this woman’s death. One woman from the neighborhood has wondered whether the sisters’ veneer of past affluence — their home was once one of the most distinguished on the street — led to a degree of deference, which worked to keep their lives, and perhaps their troubles, at a remove. 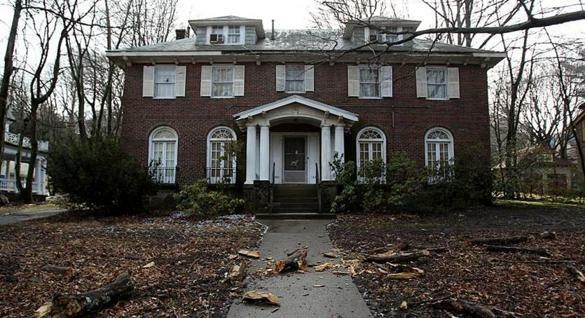 This neighbor said that out of concern for their well-being, she had checked town records that showed the sisters’ home at 122 Clinton Road, assessed at $1.2 million, is owned by a trust — Timothy Realty Trust, which has two Boston lawyers listed as trustees. Because of this, she figured these hermetic sisters had someone, at least, watching over them. This information caused her to keep a distance. 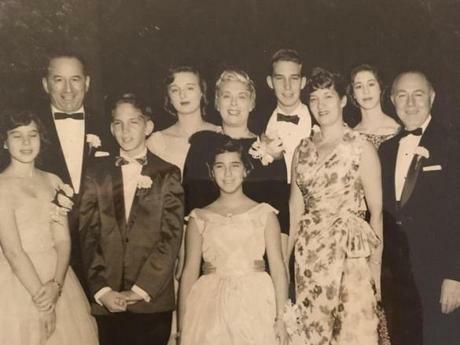 The Waldman and Carver families at a 1959 bar mitzvah ceremony in Brookline for John Carver. Front row from left: Sheryl Waldman, John Carver, Jacquelyn Carver, Lillian Carver, and Joseph Carver. Back row from left: Jack Waldman, Toby Waldman, Martha Waldman, Thomas Carver, and Lynda Waldman. During the 1950s, the three-story brick colonial on Clinton Road stood out for its elegance and for something else: Two young families — the Waldmans and the Carvers — opted to inhabit the place as one big household with six children between them. In that place and time especially, it was an extraordinary choice. In 1937, Martha Rosnosky and her sister Lillian had married two law school classmates who were friends and business partners — Martha wedded Jacob Waldman; Lillian, Joseph Carver. As they settled into married life, they all lived initially in Roxbury, though it’s unclear whether they shared a home then. 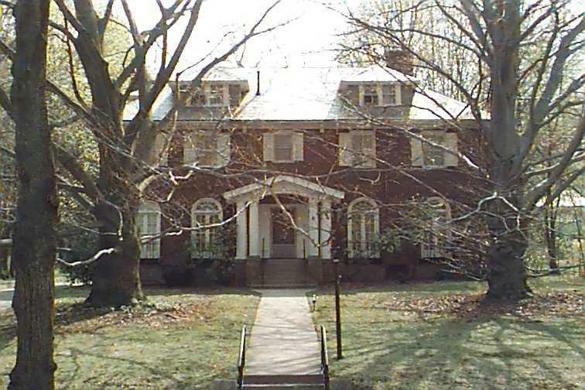 In 1949, around the time each had a third child, the two families bought the seven-bedroom Brookline house, a few blocks south of Beacon Street between Washington Square and Cleveland Circle, for $35,000, records show. The men ran a South Shore graphic arts company called Waldoroth, which made labels and decals, as well as a money-lending business and other enterprises. Their personal and business interests were so intertwined that the Waldmans and Carvers shared a common checking account for household expenses. The Waldmans’ three daughters were named Toby, Lynda, and Sheryl, while the Carvers had two sons, Thomas and John, and a daughter, Jacquelyn; all six of the children were relatively close in age. Friends of the family recall a large, unpretentious, often messy home where dogs and other pets were beloved. The Waldmans and Carvers were among the first on the street to get a color TV, and they shared a summer home in Hull. Classmates from the nearby John D. Runkle elementary and middle school, only two blocks from their house, were always welcome to drop by. Many of them recalled Lillian Carver doing most of the cooking and driving, while Martha Waldman, known for her sense of style, attended to the house in other ways. “There wasn’t a time they didn’t insist that I stay for supper,” Sanders said. The two families celebrated Passover and the High Holy Days together, and the subsequent weddings of the two Carver sons. The daughters in both families apparently never married. Family friends recalled the younger Waldman daughters, Lynda and Sheryl, as relatively tall and slender brunettes, with Lynda being the more quiet, studious one. According to her 1959 Brookline High senior yearbook entry, Lynda’s activities included working on the school newspaper and yearbook. These friends recall Sheryl as less bookish, but more agreeable and cheerful. Sanders said that, even though she lost touch with Sheryl in their late teens, she fully expected her childhood friend would graduate from the University of Wisconsin, which she attended after high school, and then, like many of her peers, marry and have a family of her own. While they all came of age during the feminist era of the 1960s and ’70s, Sanders said she viewed Sheryl as a sweet, traditional girl who loved family life. “She went with the flow,” she said. Lynda Waldman (left) at her cousin’s 1966 wedding. 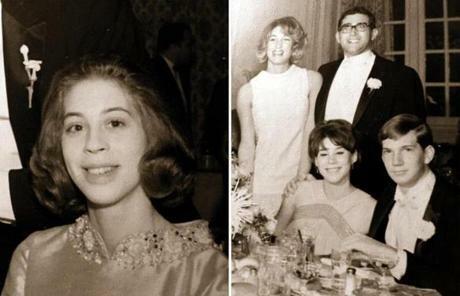 Sheryl Waldman (right, seated) at the same wedding. Beneath the surface, however, there was trouble in the Waldman-Carver household. In the mid-1960s, when Lynda and Sheryl were in their late teens and early 20s, the Waldoroth company struggled to pay its bills, and was soon hounded by creditors. The fathers each filed for personal bankruptcy while establishing joint family trusts, apparently designed to protect personal property, including the Brookline and Hull homes, from being seized, court records show. In the years to come, the eldest children from both families — Toby Waldman and Thomas Carver, both just out of college — began to play a bigger role running Waldoroth, eventually becoming the heads of the company and trustees of the family trusts. They would eventually take a dim view of Jacob Waldman’s role at Waldoroth, where he still retained an executive title of some kind, asserting he was drawing too much money — and perks — from the company. By this time, the relationship between Jacob Waldman and Joseph Carver was fraying, too, and discussions began about separating their financial interests. Things had also turned darker at home. Martha Waldman was dying of colon cancer, her painful decline coming around the time Lynda graduated from the University of Chicago and was about to start an advanced degree in library science at the University of Wisconsin, and when Sheryl Waldman was in the midst of her studies in Wisconsin. The two sisters came back to help care for their mother, according to some people who knew the family well. Martha died in 1969, at age 60. After that, Lynda and Sheryl tried to resume their schooling, but soon returned to Massachusetts — and took up residence in the Clinton Road house that now had many spare bedrooms. The members of the Carver family and Toby Waldman were moving into new homes, in downtown Boston or nearby suburbs. And bitter infighting had erupted among the families over money, with Jacob complaining about betrayed trust, especially when Toby repeatedly allied herself with the Carver side. 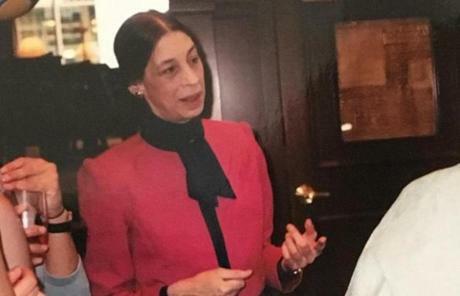 During the decade after Martha Waldman’s death, “the relations between Jack [Jacob] and the rest of the members of the family deteriorated,” said one court filing. By 1980, Joseph Carver filed legal action to separate the Waldman and Carver assets. And things only got worse from there. Toby Waldman and Thomas Carver, who were still running Waldoroth, terminated Jacob Waldman’s employment in 1980, provoking him to sue his eldest daughter in 1982 for breach of an “oral” agreement that he could work at Waldoroth as long as he wanted. “She is the only one that cared about each member of the family,” he wrote. The Globe’s repeated attempts to reach Toby Waldman, who has moved to Florida, were unsuccessful. She did not respond to messages left at the phone number under her name. Lynda and Sheryl, too, had begun to worry that they could be frozen out of their share of the family’s money and property. They hired their own lawyers and grew to distrust almost everyone — including, at times, their own lawyers, records show. It was also at about this time that some of the more questionable aspects of Jacob Waldman’s business activities surfaced, as he fought to regain his financial footing. In 1983, he had sued two businessmen involved in running controversial strip clubs in Boston’s Combat Zone, Christie Venios and Aristides Poravas, saying they owed him tens of thousands of dollars in consulting fees. They, however, asserted they had nothing more than a loan arrangement with Waldman and that all the money had been repaid. Jacob would not live long enough to see the end of the case, which languished for years in the Suffolk County civil session. As for the family’s legal battles, the Waldmans and Carvers ultimately worked out a complex settlement, but only after a judge in the summer of 1983 threatened to launch the sure-to-be-ugly trial, just to bring an end to the ordeal. “When the process of law has deteriorated so badly that the parties are filing pleadings at practically every stage of the litigation in order to prevent discovery, to harass each other and in the final analysis simply to delay . . . then it’s time this practice stopped,” said Plymouth Probate and Family Court Judge George Asack. The hard-won settlement provided that Lynda and Sheryl Waldman received the benefit of the Clinton Road property, among other assets, with the house placed under the nominal control of the Timothy Realty Trust. Even though Jacob Waldman initially agreed to the settlement, he later sought to undo it, but was unsuccessful. He felt embittered and later sought to cut Toby out of his will, according to some court records. It is unclear just how close the two sisters remained with their father in the years after the settlement. Court records suggest they looked after him when he was in his mid-70s and in poor health. But some people who knew the family well also wondered whether Sheryl Waldman’s decision in her 40s to dispense with the father’s surname and go by Hope Wheaton was born of alienation from him or the family. Lynda also in later years took on Wheaton as her last name; it is unclear why they chose that surname. Both had their names on their driver’s licenses changed to Wheaton. In 1986, Jacob Waldman died, and the death certificate lists the cause of death as metastatic prostate cancer. That same year, within months of each other, Joseph and Lillian Carver also died. Jacob Waldman’s death would initiate another Waldman family dispute over money, though court records suggest the father’s assets at this point were significantly diminished. When Toby sought to be named the executor of his estate, alleging that her two younger sisters had misappropriated assets of their father during his final years, Lynda and Sheryl produced a copy of what they said was their father’s updated will, showing that he had cut Toby out of it. Toby demanded to see the original, which the sisters apparently never produced. This triggered another lengthy court case, one that Lynda described as bringing her unbearable emotional pain. “My very being is wasting away from chronic anguish willfully inflicted,” she wrote in one court filing. A lawyer who worked with both of them said the two sisters became “very co-dependent,” with Lynda taking on the dominant “big sister” role in guiding legal strategy and writing detailed memos, and the younger sister, whom the lawyer knew as Hope, being more personally engaging but deferential to her older sister. This lawyer, who asked not to be named to avoid re-entanglement with the family, said she always wondered why Hope didn’t try to start her own life. But she also noticed Hope was fond of her older sister, laughing at her jokes and frequently sharing cigarettes with her. Lynda and Sheryl eventually prevailed in court against their older sister, but all of the legal cases took a toll. They relied even more exclusively on each other in the years to come, and retreated into a quiet life centered in the house that represented the best of their childhood. In the years that followed, much of the sisters’ day-to-day activity is unknown, as they spent it behind shuttered windows, though, after dark, neighbors sometimes saw the two women, their thin frames often in oversized clothing, walking to nearby stores. They seemed to have given up driving, and their garage for years housed an old car with long-expired license plates. Some members of the extended Waldman family who live in Massachusetts were sporadically in touch with them, while the Carver children involved in the acrimonious legal battles stayed away from Lynda and Sheryl, and declined to comment when contacted by the Globe. When reached by telephone, the oldest Carver son, Thomas, who lives in a suburb outside Boston, said he has not been involved in the lives of Lynda and Sheryl for more than three decades. “It’s behind me,” he said, then declined further comment. Neighbors observed the sisters having occasional interaction with workers — cab drivers, grocery delivery drivers, or leaf-removal contractors, though they rarely spoke to them. The layout of this exclusive residential area, with many houses set back from the street, wasn’t conducive to random neighborly interactions. And even when neighbors now and then saw the sisters raking leaves on their large front lawn, the pair usually had their backs turned and avoided the eyes of passersby. Of the two, it was Sheryl, the younger one, who more often had contact with the public. A cab driver recalled sometimes taking her on errands, during which she was reasonably talkative, often worrying that her older sister might be upset that she was spending too much. He also said she mentioned she had some ongoing health issues, though she was not specific. She always insisted he leave heavy grocery bags outside the back door, the cab driver said, never once allowing him inside. She also insisted on being picked up just outside the back door, which was at the top of the lengthy driveway, minimizing her exposure to outsiders. 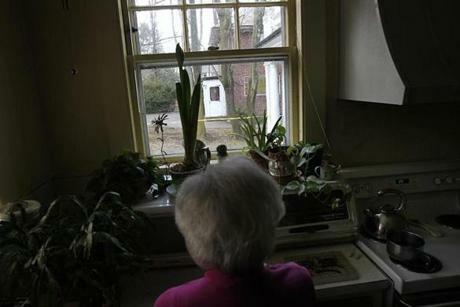 Harriet Allen, 91, a retired psychologist who lived next door on Clinton Road for decades, appears to be the only neighbor to have had an ongoing connection with the sisters, particularly the younger one, whom she first knew as Sheryl and later as Hope. Allen said Hope would sometimes call her and ask if she might join her on a shopping trip to Coolidge Corner or Chestnut Hill, though those calls — and sightings of Hope — stopped about a year and a half ago. Previously, the two would go out, sometimes on a near monthly basis, and Hope would indulge in small purchases of lottery tickets, cupcakes, and lipstick. Allen said she had very limited contact with Lynda, who sometimes appeared on the driveway with messy gray hair and unkempt clothes. She said she simply thought of her as “peculiar” but not incapable of caring for herself. As a therapist who had treated a range of patients, Allen said her more extensive interactions with Hope never led her to believe she suffered from any mental disorder, but had come to adopt a reclusive life. As the sisters increasingly retreated from view, the house and its surroundings fell into further disrepair, dangerously so when a large tree in their yard looked like it might topple over. The sisters — or their trustees — did, however, keep up with property tax payments, though they have failed in the past year to pay their bill and currently owe about $20,000. Court records show the trustees were two lawyers, John Christoforo and Dennis Duggan Jr., who used to work at Hale and Dorr, which is now WilmerHale. Records show that Christoforo has since died, and Duggan has left the law firm. Duggan, who is president of Archbishop Williams High School in Braintree, declined to respond to repeated phone messages the Globe left at work and at his Milton home, asking about his role with the sisters. The trust, records show, appears to be the type that is largely run by the beneficiaries. Town health officials apparently contacted Duggan at some point in their investigation. “Spoke with Dennis Duggan Jr. He wrote trust b/c he was only attorney that the Wheaton sisters would speak to. Described them as reclusive/insular/anti-social,” said the department’s note, obtained through public records requests. Much of what drew neighbors’ attention to the two sisters was the deterioration of the house, with its peeling paint and rotting wood. The next-door neighbor, Allen, remembers one time within the last two years, however, when she dropped off a copy of Time magazine through the back door, and something else repelled her. Harriet Allen lives next door to the home where the two elderly sisters lived. This is the kitchen window where she could see them, now and then. Last summer, Brookline police received three calls to check on the well-being of the occupants of 122 Clinton Rd. In each case, the officers never stepped inside the front door — and in one case, they never spoke to anyone at the house before leaving, records show. The first call, on June 8, came from a concerned neighbor who is also a real estate agent. An officer that day walked around the house on foot, knocked on the doors, and noted the severe decay of the premises. He talked to neighbors who said two reclusive sisters lived there. Two weeks later, a National Grid worker asked police to check on the occupants after being unable to get a response at the door. When an officer this time was able to get a woman — he described her as “disheveled and in her mid-sixties” — to come to the door, she was insistent “that everything was OK,” said the report. This case worker was employed by Springwell, a private agency hired by the state to oversee elder protective services cases. Such cases are typically opened when someone complains — and there is a basis to believe — an older person may be at risk for harm due to abuse or neglect. Springwell and state social service officials have declined to say who called in the complaint, citing confidentiality laws. Firefighters and ambulance workers joined police and the case worker in responding to this call. Ultimately, firefighters got a woman to answer the back door, and the case worker talked with her. After this interaction, the case worker told officers that everything was “all set” and they all left. The case worker, Springwell, and state authorities have declined to answer questions from the Globe about what assurances they received that Hope Wheaton was fine. They declined to say how the woman at the door identified herself, and whether they asked to speak to the second occupant of the house. Meanwhile, the town’s health department was becoming even more alarmed by the condition of the house. The home on Clinton Road as viewed from the upstairs window of the home next door belonging to Harriet Allen. On a cold winter weekday almost three months ago, Lynda Waldman was in a state of high distress. According to those familiar with the investigation, Lynda had called a cousin to say she needed a place to stay because there was no running water, and her water pipes may have frozen. Then another cousin, a social worker by training, came to pick her up. When she got there, she did what no one had apparently done for several decades, perhaps because Lynda may have already gotten into the waiting car: This cousin entered the house. There, underneath a kitchen table, was the badly decomposed body of someone she had known since childhood — the cousin she first knew as Sheryl Waldman. She called police, who rushed to the scene and logged a “sudden death” report. It was clear, however, that the younger sister’s death was not a recent event. “When officers responded it was obvious that Hope had been deceased for a lengthy time,” said a police department report. According to the death certificate, Sheryl Waldman’s body was cremated. In the weeks that followed, Lynda Waldman remained very much in charge of the Clinton Road home. While staying with a cousin, then later at a hotel outside of Boston, she began calling contractors about needed repairs to the decrepit house. She did not seem particularly bothered by the public discovery of her sister’s long-dead body, according to those close to the investigation. A spokesman for the Norfolk district attorney’s office said the investigation into the death remains open, and he declined to comment on whether Lynda Waldman could face any charges involving her failure to report the body. Neighbors say they find it chilling that Lynda might someday return to the home now publicly associated with a corpse. But town officials say that unless she is deemed legally incapable of living on her own or faces serious criminal charges, she is entitled to resume living in her home once it is considered safe for human habitation. Some town authorities say it’s not easy to intervene in the lives of vulnerable people who want to be left alone, as they can assert formidable legal challenges to unwanted attention. “How do you break through to people who want to be isolated?” said Ruthann Dobek, director of the Brookline Council on Aging. 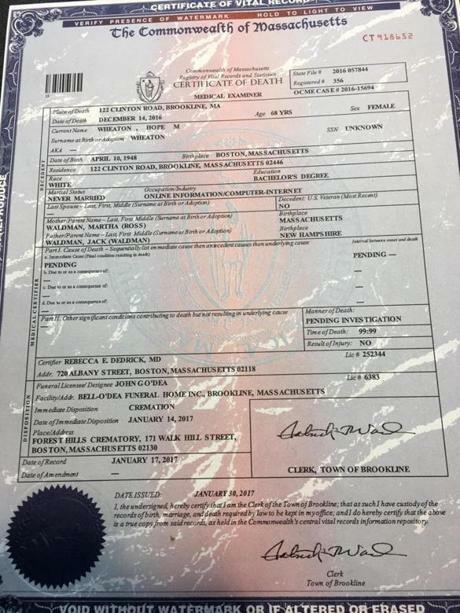 The pending death certificate for Hope Wheaton (formerly known as Sheryl Waldman). A month after Lynda Waldman moved out of her home, a Globe reporter went to the hotel where she was staying. She emerged from her room, holding a walker and wearing a large coat. When asked about her sister’s death, Lynda calmly asked the reporter to go away and to not ask any questions. With her shoulder-length gray hair seemingly newly washed, she spoke in a clear, articulate voice, saying she had much to do. She said problems with the house should have been resolved long ago, and she is now trying to address them. The reporter then asked: What happened to Hope? The older sister shook her head as she struggled to balance herself on the walker. She again told the reporter to leave her alone. 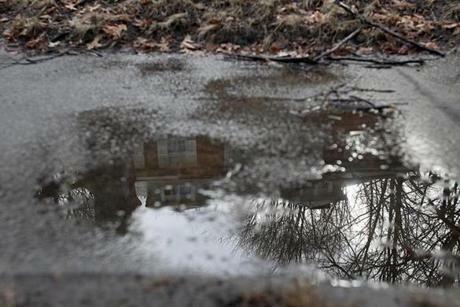 The Clinton Road home reflected in a puddle on the sidewalk.